I can’t run a productivity company and not be on the top of my game, right? Here’s our anti-term sheet for VCs… Do you have yours? Pretty soon GipsyBot will embark on a fundraising journey, naturally I’ve started thinking about the most productive way to find the “perfect VC”. I’ve read enough blogs posts on fundraising, they all focus on the same thing: how to pitch. But few of them talk about the selection process from a founders’ standpoint. And for me, at least at this stage, that’s far more important than my deck or the size of my raise. I want to look forward to board meetings. I don’t want to view them as a chore. Similar to how one would write a criteria for finding someone to share their life once they decide they want to get married, I started creating a list of the things I’m looking forward from our future VC partner. This post from Paul Graham on what to look for in a founder also inspired me. The ability to delegate effectively is no doubt one of the most important skills for managers. A study conducted in 2012 by Lawrence Technological University reported that 70% of leaders state they routinely delegate and 20% state they delegate often. Yet that majority of managers report struggling with too much on their plate. More often than not – it’s not that managers are delegating too much but that they are not delegating effectively. From our conversations with effective delegators, we’ve noticed certain patterns that we’re going to share with you in this article. We hope the following tips will help make you a better delegator at work. You would be surprised how many managers make the mistake of not confirming acceptance of an assignment, and are surprised when tasks aren’t completed or deadlines not met. Communication is the key to success is any team, and it is critical that you confirm your subordinate understands and accepts the assignment. What is the result you seek? This should be clear to both the delegator and delegatee. If the deliverable is clear, and the scope defined, you minimize the number of revisions and clarification emails you receive down the road. One of the biggest obstacles to effective delegation is not trusting subordinates to solve a problem, and consequently delegating specific tasks instead of the problem. Not only this reduce employee satisfaction, it creates more work for you. Instead, focus on defining the problem that needs to be solved, and leave the rest to your employee. Needless to say, set clear delivery date expectations! While you might assume tasks can be completed within a certain time, people might have something else on their plate. Don’t let guesswork run your team – communicate, don’t assume. If you’re a frequent delegator, you’ll probably find it helpful to track your delegated tasks and when each is due. Avoid trying to remember them all in your head – it will only occupy your mindspace and make you less productive. You can use a journal, place emails in a “delegated” folder, or use GipsyBot, which specializes in managing delegated tasks. Ad hoc requests are tasks that come up unexpectedly, aren’t planned for, and are typically outside of a project’s scope. Regardless of whether your role requires you to assign these tasks to others or to complete them, they’re silently a productivity killer for everyone. But just how bad are they? Research conducted at the University of California, Irvine, found that it takes around 20 minutes for the average office worker to become re-absorbed in a task after an interruption. For some jobs like programming, it can take an hour or longer. We’ve all know the feeling of being “in the zone” when working on a task, and ad hoc requests remove us from that zone. For fellow productivity fanatics who’ve read Getting Things Done by David Allen, you’ve experienced the importance and value of capturing every single task that comes your way. Capturing tasks allows you to get things off your mind. Otherwise, your brain will continually be distracted by the countless number of things you have to do.Capturing ad-hoc requests is a challenge both for the assignor and the assignee. As there are no effective tools for managing these tasks, assignors are forced to keep post-it notes all over their desks, or create convoluted color-coded solutions with Microsoft Outlook folders, or rely on their memory.Assignees on the other end are challenged to remember what they promised to whom, and for when. In addition they have no easy way to prioritize all the requests they receive. They may have captured the requests in their own to do list, but that does not help with these two issues. You can plan and list out all your tasks, but it’s pointless without grounding the tasks in the time it takes to do them. Knowing exactly how much time you have in a day and how your tasks fit into that time prevents you from overbooking yourself. You can keep also reliably track your productivity and find ways to improve. For instance, you might want to know: which tasks consistently take you longer than expected? Which tasks occupy most of your time? For the first time ever, an AI bot exists that can answer and do all of this for you. Time is fluid. Schedules change. It’s impossible to plan out your time too far into the future, and we recognize that. This is where a lot of the criticism of time management falls apart. Proponents of task management argue that time management results in too many tasks, and ignores prioritization. This isn’t a problem when you only manage your hours in one day. Again, time management can’t replace your task management tools, it’s meant to complement it. 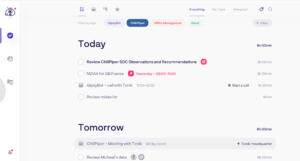 Gipsybot focuses on the number of hours you have in one day, and automatically schedules your time for you, so that you know exactly what you have to work on, and when. Planning can only take you so far without action. When you know exactly how much time you have given yourself to complete something, you push yourself to finish it in that time. After all, to-do-list items are not meant to be big tasks spanning days or even weeks. They should be small and manageable enough that you can realistically finish them within one day. Of course, managing your tasks based on time also holds you accountable for completing them – especially useful if you tend to procrastinate or are easily distracted. It’s necessary for teams, and now, it’s possible! Once your team has figured out which tasks to work on and who’s doing it, it’s time to deliver. Easier said than done – delays are inevitable when dealing with many internal and external stakeholders, causing a ripple effect across your entire team. While coordinating tasks is easy, coordinating individual schedules is difficult and time-consuming. But nothing good comes easy, right? Don’t worry, we did the hard work for you. GipsyBot allows you to delegate tasks in an intelligent way that adapts to people’s schedules, resulting in more doing and less head-butting. 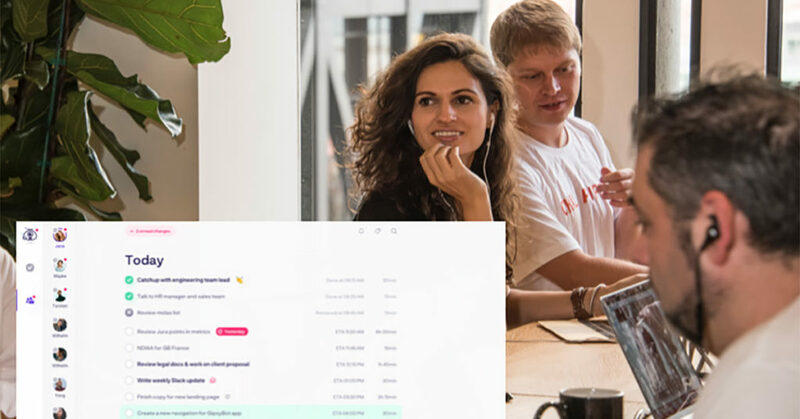 We’ve built the most effective and intelligent time management tool ever, and we’re excited to be giving out beta access invite-codes for eager productivity enthusiasts to try. We’ve had terrific feedback so far – according to our testers, Gipsybot has meaningfully increased their productivity. It has been more than 10 years since the release of the first iOS, and since then we’ve seen the number of productivity apps and software as a whole has skyrocketed. Recently, major tech players have been adding productivity tools to their app portfolios through both internal development and acquisitions. We’ve organized the current task management software landscape into 4 broad categories by function, analyzing overall trends as well as trends within each category, and added a fifth, emerging category: AI-powered Task Management. To-Do-List apps have become more and more feature-rich over time. Given the rise of mobile, it’s no surprise that multi-device support is one core feature of all major to-do-list software, although most lightweight to-do-list apps operate only on mobile. For more powerful apps, collaboration and integration support is critical and expected. Many team-oriented to-do-list apps also support real-time communication via commentary on tasks. Transferring calendar events and tasks to and from different platforms is also getting easier through new automatic import solutions. Note-taking apps are and have always been relatively simple and feature-bare. For most users, OEM software such as Notes on macOS and iOS have been sufficient. Ability to access notes on multiple devices via cloud is a must-have, and that accessibility remains a competitive advantage for large tech companies like Microsoft, Google, and Apple, whose hardware and software ecosystems make that easy. Recently, Google has released the note keeping app, Google Keep. Although it was well-received, Microsoft OneNote still remains the favorite amongst diligent note takers. For smaller developers, UI and design are often key to differentiating their product. In recent years, there has been a large shift in project management methodology towards Agile, not just in IT, but across many different business functions and industries, including marketing, sales, finance, and construction. Some common attributes in project management released in recent years include support for faster communication, and rapid and continuous output from projects. This shift has led industry leaders like Atlassian to acquire or build their own software that utilize this new framework. Most industries requiring task management are well served by general task management software, but some niche industries require specific solutions for their needs. Software in these niche industries have traditionally faced less competition – not a surprise given its smaller market. Software for niche industries usually include task management only as part of a larger, comprehensive business management solution. Which of these 9 unique to-do-list apps is made for you? With the huge number of To-Do-List apps out there these days, it can be a real hassle to figure out which app is the right one for you without trying them all. We know just how tedious that is. Even the best apps always seem to be missing a feature here and there. The truth is, every app requires you to adapt your behaviour in order to make the most of it. We’ve prepared a review of 8 very different to-do-list apps so you can find the one that best suits your preferences. And of course we’ve added GipsyBot to the list to explain how it’s different! 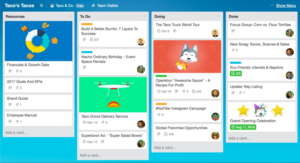 The service will do well for most people and for most purposes, but given its strategy of serving the common denominator, Trello might not be for you if you have more specific requirements, or are looking for a lighter solution. Targeted more towards personal users, Wunderlist is great as a lightweight alternative to more complicated task management apps. With over 13 million users, it is one of the most popular apps on iOS and Android. For those who don’t like too many things going on at once, Wunderlist keeps your task list clean and only shows one list of items at a time. Wunderlist’s integrations with other apps is a bit behind the curve, not a surprise given the app’s focus on simplicity. 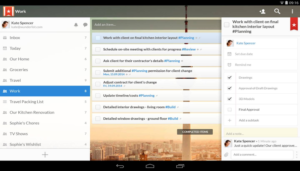 In 2017 Microsoft acquired Wunderlist and began building a more intelligent to-do-list, called Microsoft To-Do. 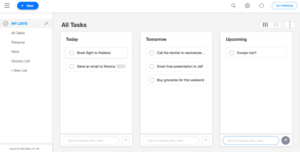 The new service introduced “Intelligent Suggestions”, which automatically prioritizes important tasks such as what’s due or upcoming, or overdue tasks from yesterday. If you’re a Wunderlist user, Microsoft has also built an importer to help you easily transfer tasks and events from Wunderlist to To-Do. Todoist is great for people who work frequently in different locations and like to manage their tasks anywhere. The company’s focus on multi-device support clearly resonates with its large user base of more than 13 million users. One cool feature is natural language input when writing tasks, allowing users to schedule, assign, and categorize directly from the task input box, significantly reducing clicks. Over time, users can build up their ‘productivity score’, with incentives such as karma, streaks, and daily goals. 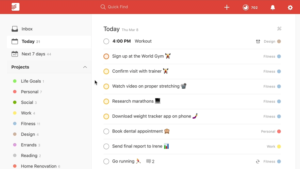 Smaller teams should find Todoist’s features to be sufficient, although the app fares better for personal use. If you’re the kind of person who likes to keep sticky notes of their to-do-list items, Google Keep is for you. Built into the Google ecosystem (meaning no new accounts, yay! 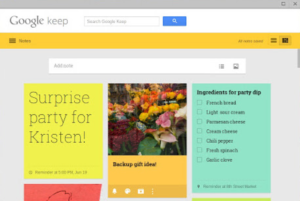 ), Google Keep is a relatively lightweight solution with all the basic functions. But what sets Keep apart is all the benefits of the Google ecosystem: reminders sync directly between Keep, Inbox, and Calendar – perfect for those who use Google apps extensively. Besides mobile and web, the app also comes as an extension so that you can create notes from any website. Any.do is a minimalistic, easy-to-use To-Do-List app that is great for personal users who are looking for something a little more capable than Apple Reminders. While Any.do’s mobile UI is great, the web app unfortunately falls short and seems to be designed by a mobile team rather than a web team. 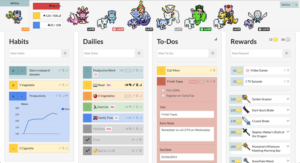 Taking one of the most interesting approaches to managing tasks, Habitica turns your daily tasks and habits into a game. Not only do users enter their to-do’s, they also enter both their good and bad habits, as well as real life rewards, such as ‘watching a movie’ for motivation. Users can connect with other users and complete quests together – don’t worry, the quests are all items to do in real life that help the user complete their goals. The original Things app released in 2008 was one of the earliest successful task management apps released on iOS and Mac. Very recently, the developer Cultured Code released an all new, redesigned version with a host of new, well thought-out features. 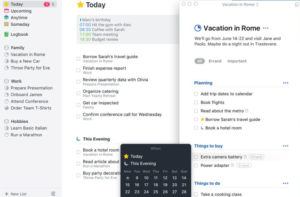 Perhaps the best of these is the upcoming view, which allows users to see their calendar, to-do’s, and reminders all in one view. Targeted towards personal users, Things doesn’t support collaboration or sharing, but is certainly powerful enough for even the busiest of people. 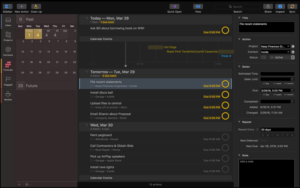 When it comes to raw performance, nothing really comes close to OmniFocus. The software looks and feels heavy-duty, and has an incredible number of features. Of course, this comes at the cost of usability, so it’s definitely recommended more for users with an equally heavy to-do-list. Because OmniFocus’ UI and features are designed for desktop, the software is not suitable for people who need to keep track of things on-the-go. 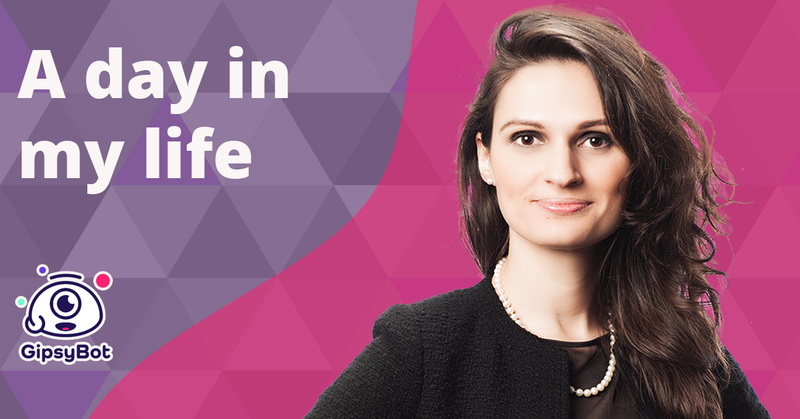 GipsyBot starts with the basic idea that we have multiple lives – personal, work, social, etc – and multiple people to coordinate with, but only one timeline. Hence a real effective task & time management solution needs to capture every explicit and implicit task, self-assigned or delegated, from inbox to other apps, and intelligently schedule these tasks on an ongoing basis. This provides a brand new experience, unlike any of the other to-do list apps above. Worth a try for everyone!